The Major League Lacrosse trade deadline was more eventful than most, and the Chesapeake Bayhawks making four moves led the way. 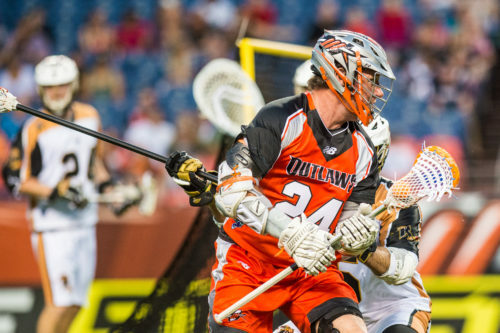 The Bayhawks sent Drew Westervelt to the New York Lizards, while the other big deal of the day involved John Grant Jr being shipped from the Denver Outlaws to the Ohio Machine. Grant being moved was the first transaction of the day, with the Machine sending goaltender Adam Fullteron to Denver along with a 2017 second round draft pick. Grant, the all-time leader in points in MLL, has 16 this season over six games. Fullteron played with the Outlaws for four years previous, and will be a welcomed addition to a team that has been playing rookie Ryan LaPlante. Westervelt joins the first place Lizards after the Bayhawks shipped away the veteran. In seven games this season, Westervelt has amassed 17 points and has 328 in his career. Going back to the Bayhawks is a second round pick in 2017. The Lizards waved defender Andrew Casimir to make room for Westervelt. The Bayhawks also added faceoff man Mike Poppleton from the Rochester Rattlers, who will presumably backup Anthony Kelly. Going back to the Rattlers was a 2017 supplemental round second round pick. Chesapeake added midfielder Kevin Cooper from the Atlanta Blaze for a fifth round collegiate draft pick and defender John Yozzo-Scaperotta. Cooper has been a point-per-game player for the Blaze this season. Chesapeake was not done dealing from there, sending defenseman Kyle Sweeney to the Charlotte Hounds for the Hounds first round pick in the supplemental draft. Sweeney has 22 groundballs this season with the Bayhawks and is historically one of the league’s best defenders. The only inactive teams on the day were the Florida Launch and Boston Cannons. The Cannons picked up Atlanta midfielder Joe LoCascio on waivers the day previous, while the Launch lost David Earl from their practice roster.